I planned on spending Christmas the way most other Jews spend Christmas—at the movies (why hello Christian Bale! ), but JFS had other plans in store for me. Hastings House is a low-income housing option for seniors in the Metrowest area. JFS of Metrowest does a lot of work with the residents there through our Healthy Aging and Healthy Partners programs. 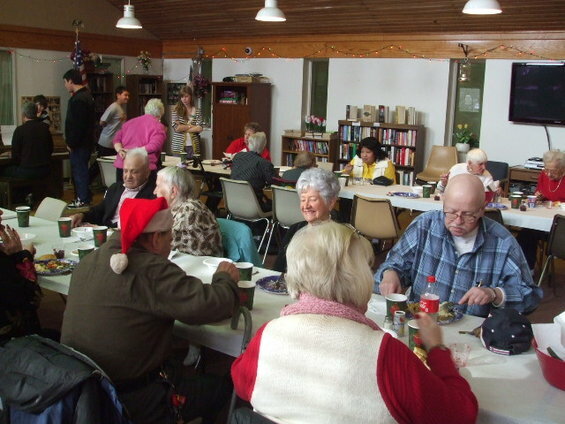 This year Malka Young, our Director of Community Impacts, arranged a partnership between JFS, the Framingham Housing Authority and the brotherhood of Temple Beth Am in Framingham to bring a Christmas meal to residents of Hastings House and other local senior housing communities who did not have plans for Christmas. The brotherhood had a small army of volunteers—there were kids to set the table, adults to put up coffee, teenagers to transfer food to serving platters. My role was relegated to “general overseer of very busy people”/ “bathroom guide,” so I spent most of my time in the lobby making friends. When I got there, Beth offered to show me where the bathrooms were located. She also introduced me to the grocery cart under the stairwell—which really came in handy when the brotherhood arrived with a lot of food equipment that needed carting in. As Beth and I spoke we realized that I actually know her family, I grew up with her granddaughter. Claire gave me a tour of her apartment. She has fourteen grandchildren. She bought a huge mirror sized hanging picture frame to hold their photos, but hasn’t gotten around to filling it yet. It’s currently filled with photos of an attractive family playing at the beach. Ellen and I chatted about dogs—my favorite topic of conversation. FYI: I will show photos of my dog to anyone (strangers on the T, the guy creasing my ticket at the movie theater) if provoked. When the food was served and all sat down to eat, I bid adieu to my new friends and headed out. It was one of the best Christmas’s I’ve ever had. I think a lot of people have this preconceived notion about volunteering that it’s all about serving and giving back and that’s definitely true, but it’s also about gaining. It’s about opening yourself up to a situation that maybe you wouldn’t find yourself in otherwise and allowing the experience to affect you. Had I gone there focused solely on providing a service, I probably would have missed out on getting to know all of these wonderful people. There are a lot of different ways to volunteer. Some of them inherently don’t involve a lot of human interaction and that doesn’t make the deed any less noble. But for those who do choose a more social outlet for volunteering, whether it’s distributing food or overseeing an event, arrive with the mindset that you’re there to make friends, not just provide a service. Any type of volunteering is bound to make you feel good, but I truly feel that only by opening yourself up to the experience will you be fulfilled.